The G&G Pregnancy Pack contains a selection of carefully selected vitamin and mineral supplements to aid in foetal development* and to maintain the ideal balance of nutrients for an expectant mother. It is ideal for taking when trying to conceive, and throughout pregnancy. 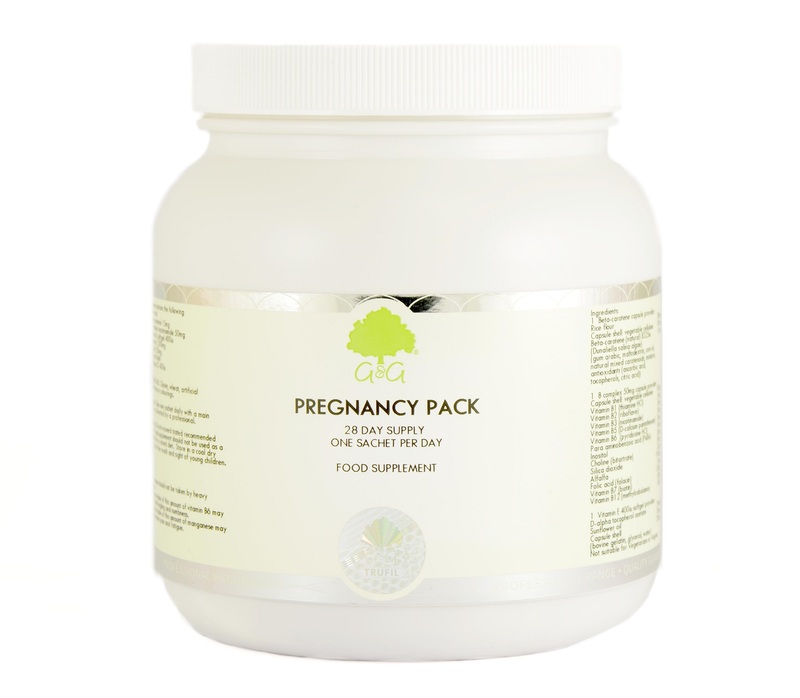 The Pregnancy Pack contains an extremely effective form of folic acid. Conventional folic acid is synthetic and is used in many vitamin supplements. We use L-5-methyltetrahydrofolate (L-5-MTHF), which is the active form of folic acid and is found in nature. The folic acid found in food has to be digested to be absorbed, and then has to undergo several biochemical conversions in the body to become L-5-MTHF. By supplementing directly with L-5-MTHF (rather than synthetic folic acid), one can be assured of getting the benefits of folic acid, regardless of your ability to absorb or convert it to the active form. *Supplemental folic acid intake increases maternal folate status. Low maternal folate status is a risk factor in the development of neural tube defects in the developing foetus. the beneficial effect is obtained with a supplemental folic acid daily intake of 400 mcg for at least one month before and up to three months after conception. WHAT DO YOU GET IN OUR PREGNANCY PACK? Folic Acid is a water-soluble nutrient that is part of the vitamin B complex family. It is essential to the formation of red blood cells. Supplemental folic acid intake increases maternal folate status. Our natural beta-carotene supplement is made with Dunaliella salina, a type of micro-algae found in sea salt fields. To survive the salty conditions this micro-algae has high concentrations of beta-carotene to protect against the intense light. We harness the nutrition from the algae within a vegetarian capsule to create a natural healthy supplement that assists in the formation of vitamin A by the human body. Long term intake of 2mg of manganese may lead to muscle pain and fatigue.